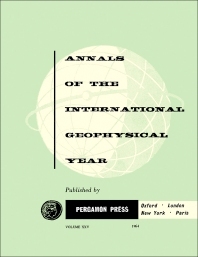 Annals of the International Geophysical Year, Volume 25: Auroral Spectrograph Data is a five-chapter text that contains tabulations of auroral spectrograph data. The patrol spectrograph built by the Perkin-Elmer Corporation for the Aurora and Airglow Program of the IGY is a high-speed, low-dispersion, automatic instrument designed to photograph spectra of aurora occurring along a given magnetic meridian of the sky. Data from each spectral frame were recorded on an IBM punched card. The data recorded on the cards are printed onto the tabulations in this volume. These tabulations are available in the World Data Centers for auroral (instrumental) observations in College, Alaska, Moscow, and Stockholm in the form of this printed volume of the IGY Annals. The remaining four chapters are data tabulations for United States, New Zealand, Canada, United Kingdom, and U.S.S.R. stations. This book will prove useful to geophysicists.